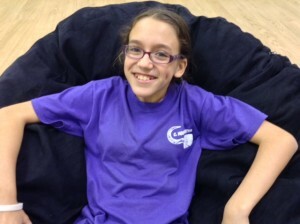 At 12 years old, Rebekah is by far our youngest guest blogger. Rebekah is our guest blogger. She recently took a risk when she wrote an essay on Brain Highways for a school assignment. Until then, she had not shared with anyone (other than her family) how she had been organizing her brain. But In Rebekah’s essay, we get to “experience” a community screening session through the eyes of a 12-year-old girl. She holds nothing back in regards to what she thinks about her first time at the Brain Highways Center. Yet, at the end of the essay, Rebekah shares incredible insights and reflections about her experience organizing her brain over the past four months. And at that point, it’s hard to believe Rebekah is just 12. There is a life changing class called Brain Highways. The basic concept of Brain Highways is that when we were babies we crept and crawled, and while we did, our brain got developed because of those movements. If we didn’t do as much creeping and crawling as we should have, because of all the strollers and playpens, our brain isn’t fully developed. When kids have a disorganized brain, they may not feel full, get overly anxious, have irrational behavior, get distracted and go off topic really easily, talk a lot or talk too little, and lose their place when reading. It turns out that almost everyone has an underdeveloped brain. We just learn to live with it. As we get older, it gets more difficult to cope with, so we get overwhelmed. It really stinks to be underdeveloped. There is still hope! When people go to Brain Highways, they “go back in time” and creep and crawl like a baby would and that connects the neurons we should have connected and we have a completed brain! The cool thing is that it’s never too late to do the class. There are four year olds and people who are eighty who did it! When my mom heard about Brain Highways, she wanted me to go with her to go check it out. I didn’t want to go. I had seen all the videos on their website (brainhighways.com) and I thought they were funny and interesting, but I didn’t want that extra work in my life. At the moment, the concept was silly; creeping on our bellies and crawling like a dog. Then my mom would sigh and say, “Rebekah, have a good attitude about this. Now, I’m going. Are you? Eventually I agreed to go. It was a long drive from San Diego to Encinitas, and I thought we would never make it. I thought about how ridiculous and stupid this was. When we walked, or in my case, “slouched” into the center, I saw a bunch of kids creeping on the floor. I looked at them with disgust. Why would I want to be with them, making a fool out of myself? We were taken to a back room with about 6 to 7 other kids. There were mostly boys and all of them were 6 to 10 years old, and being the only 12 year old was awkward. The parents had to stay behind to talk or something. I didn’t want to leave them, but I followed all the other kids in the room. The room was filled with toys like silly putty, slinkies, squishy things, and building blocks. There were a few pictures of kids playing with toys on the wall. One of the adults came over and invited me to a game with a few other kids. I thought that playing with building blocks was for kids, but I eventually gave in. While I was playing with those stupidly silly toys, my mom and the other parents were watching a video on Brain Highways and red flags for an underdeveloped pons and that sort of stuff. Then they took us out of the back room and did a bunch of screenings to see how developed our brains were. “Follow it with just your eyes,” Nancy said to me. I did, and she started talking to me. We talked about school, how annoying English can be, and why we need to learn long division when we have calculators. Or at least she talked. I sort of said a few words, and Nancy said that I did that because my brain was so occupied with following the pencil that I didn’t want to talk. I guess it makes sense, but I probably wouldn’t have wanted to talk even if she wasn’t assessing my eye tracking skills. Next, she had us stand on one leg while she talked to us. Again, I didn’t want to talk. I passed the “she can balance” assessment, but didn’t pass the balance and “talk at the same time” assessment for the same reason I couldn’t track the pencil and talk at the same time. After that, Nancy talked a bit more to us kids about Brain Highways. My mom signed me up (against my will) and we went home. On Sundays and Tuesdays I would go the center and some other kids in my class and I would creep and crawl together. The director could think of some pretty wild games to play while creeping. After that we got assignment sheets on what to do in the week like activities, ideas for games, and statistics on how we were doing as far as our brain development. I have to admit it isn’t as bad as I thought it would be. Sure, it’s a lot of work, but it gets easier and easier. Everybody thinks I’m crazy for thinking that moving like a baby will help my brain, and I totally get it, but it’s that kind of thing where you have to do it to understand it. Every once in a while some new kids will come in for that first screening session. They see me creeping, and they look at me with the same distain that I once looked at the other kids. I just share a private giggle at how much their life will change. As I look back and think of what I was and what I am, it doesn’t really matter how ridiculous I might have looked. It doesn’t matter how much time and energy it took. I have seen the change in me and the other kids in the class, and it was totally worth it to have a developed brain and an easier life!